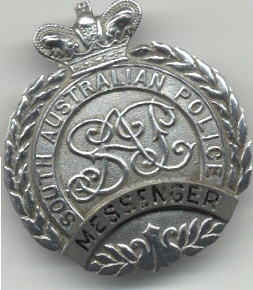 South Australian Police and South Australian Police Department badge history. 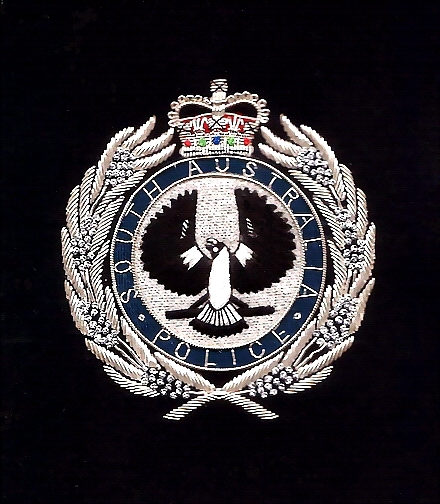 Note: The State arms, seal and name: South Australia Police are Copyright © State of South Australia. HRH "The Queen's Crown" ("Saint Edward's Crown") is Copyright © The Royal Household and its use granted solely by Royal Warrant. 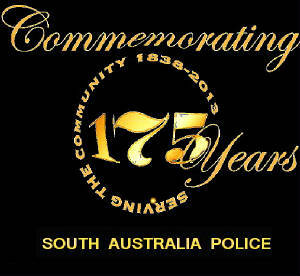 T he South Australia Police Force is the oldest Police organisation in Australasia and one of the oldest established Police Forces in the world. 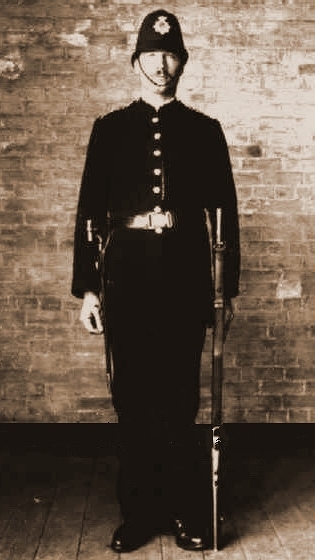 It is unique in the history of Australian Police Forces, as since 1838, it has been continually centrally administrated. In 1863, the administration of the Northern Territory was also taken over by the South Australian Government; until 1911. At one time SAPOL was patrolling almost one third of Australia; one of the largest land mass areas ever controlled by a single Police Force. Please see: SAPOL Historical Society. 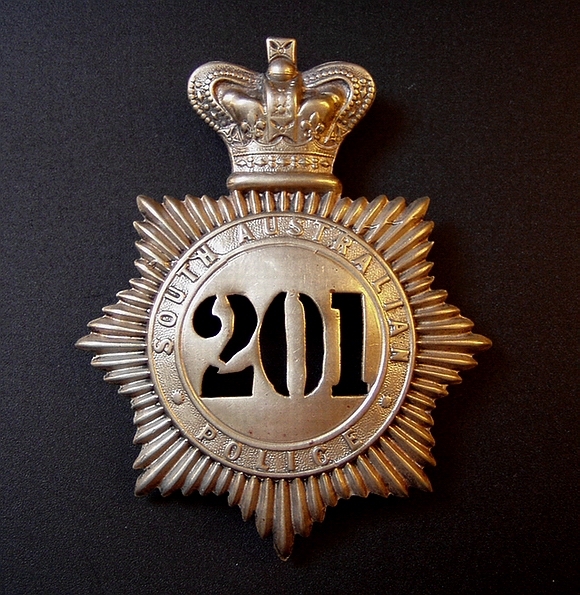 Queen Victoria Crown, South Australian Police, brass metal helmet plate. A beautiful, very rare plate from c1898. Extremely Rare. 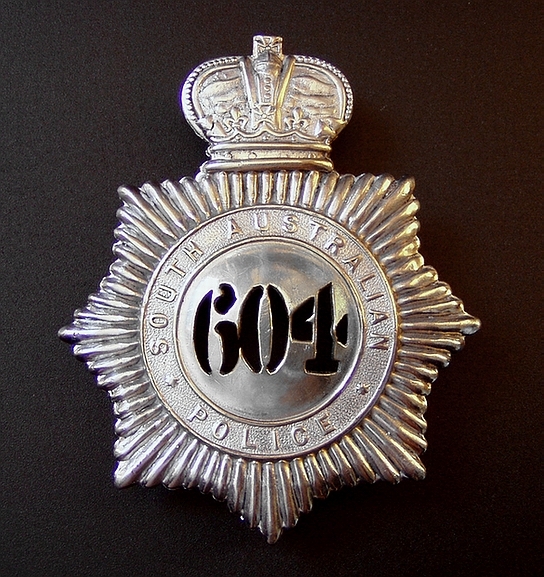 South Australian Police, King's Crown Helmet, Plate. These old QVC plates had been re-crowned due to a new monarch in 1901 (King Edward VII). They were also nickel plated and after 1938, many were also chromed. There was also an identical fully die struck King's Crown version; made after the supply of the reused versions was finally exhausted in the late 1930's. c 1913-1954. Between 1884 and 1913, white metal numbers, were mostly used on helmets. Very Rare. The first, South Australia Police (SAPOL), Queen's Crown, ID badge; as issued in a serial numbered leather wallet. 1985-1995. Rare. SAPD Detective's Fob ID badge. These badges were not issued by the SAPD; each one was individually hand made for the officer by a local jeweller. c 1940's. All these are * One of a kind. Ozbadge.com thanks The South Australian Police Historical Society Inc and Gordon Maulday. 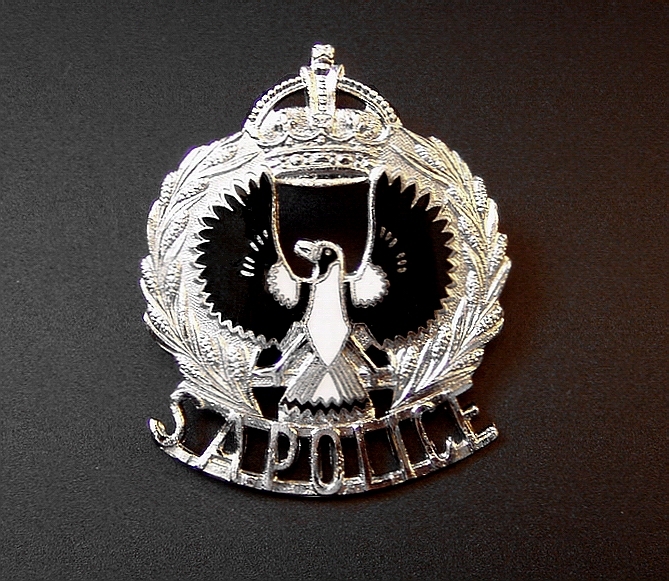 South Australia Police, King's Crown "Piping Shrike" Cap Badge. c 1950. Was also worn unofficially, as well as the new Queen's Crown version (right); to denote "seniority". Rare. 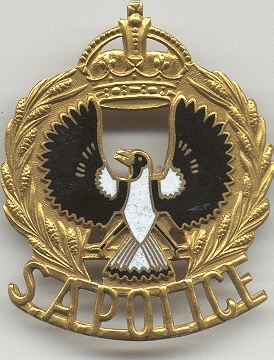 SAPOL, Queen's Crown "Transit" Police Cap Badge. 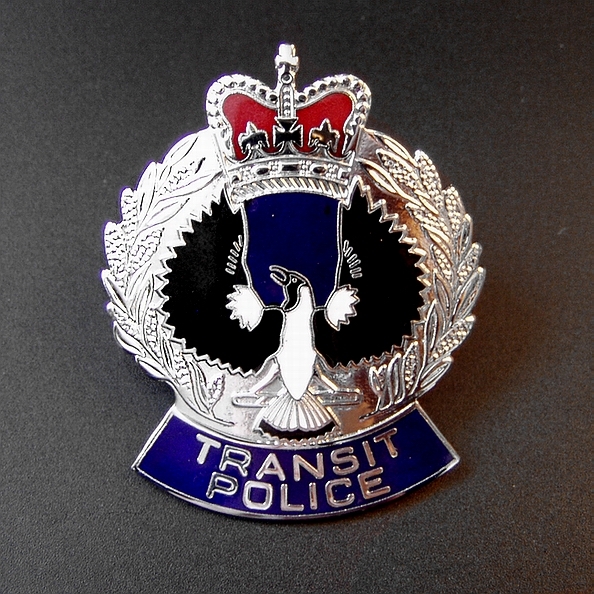 The SAPOL "Transit Police" were formed on the December 31st, 1993 with full "Police" powers. There is also a flat ID badge; used in a serial numbered wallet. Hallmarked. c 1980's. Rare. Also in a transitional "Transit Officer" (1992-1993) version and a "Security Officer" version. 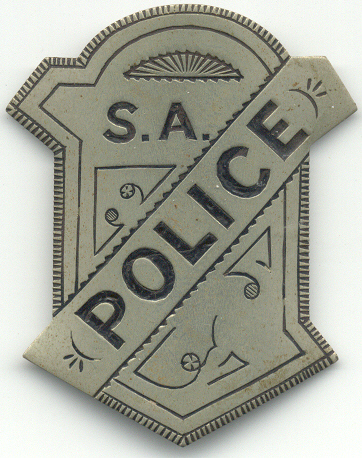 Earlier, the SA "Transit Police" first wore a South Australian Railways "Constable" badge and changed to a State Transport Authority "Constable" badge in 1974. All "Transit Police" were fully "integrated" into SAPOL by 1993. Scarce. 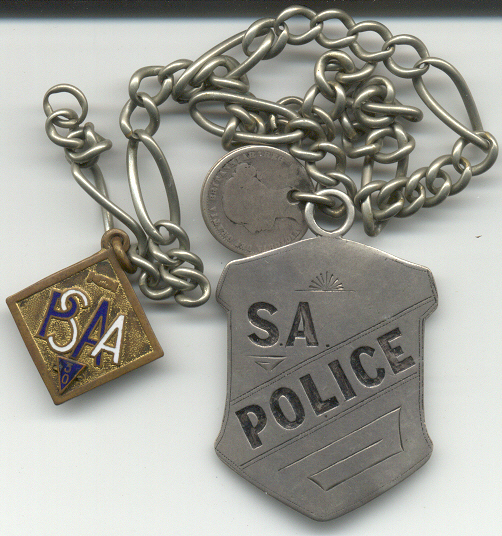 SAPD Detective's Female Brooch ID badge. These badges were not issued by the SAPD; each one was individually hand made for the officer by a local jeweller. c 1940's. SAPD Messsenger's hat badge with the Queen Victoria Crown. Extremely Rare. 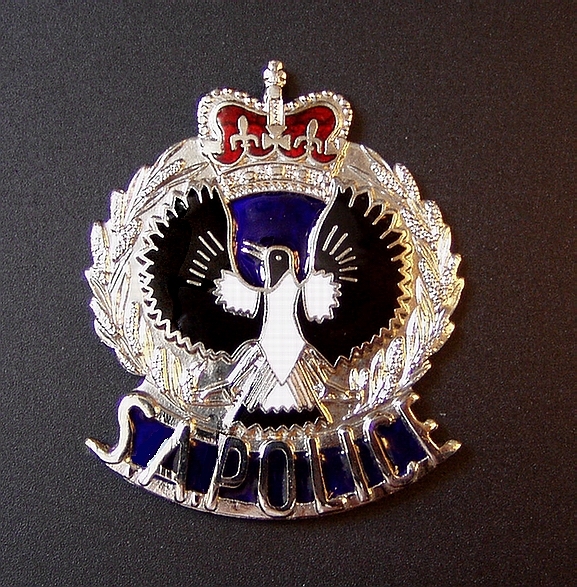 South Australia Police introduced a new Cap badge and ID badge (in a numbered wallet) in 1995. There was also a "SECURITY" in plinth version issued in 1997, which was replaced by the current "gold" Police Security Services Branch (PSSB) version. A current style social blazer bullion badge; shown above. 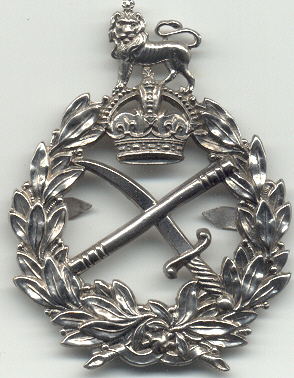 A "flattened" version of this badge was used as an ID badge from 1980-1985. SAPD Commissioner's cap badge. 9ct gold and hallmarked AMOR. 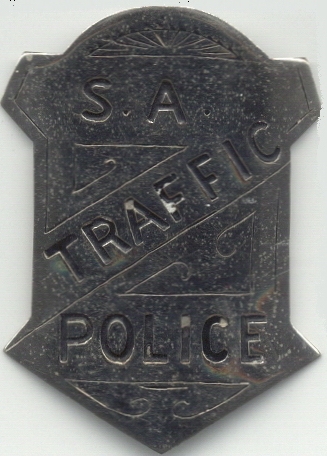 SAPD Traffic Officer's ID badge. 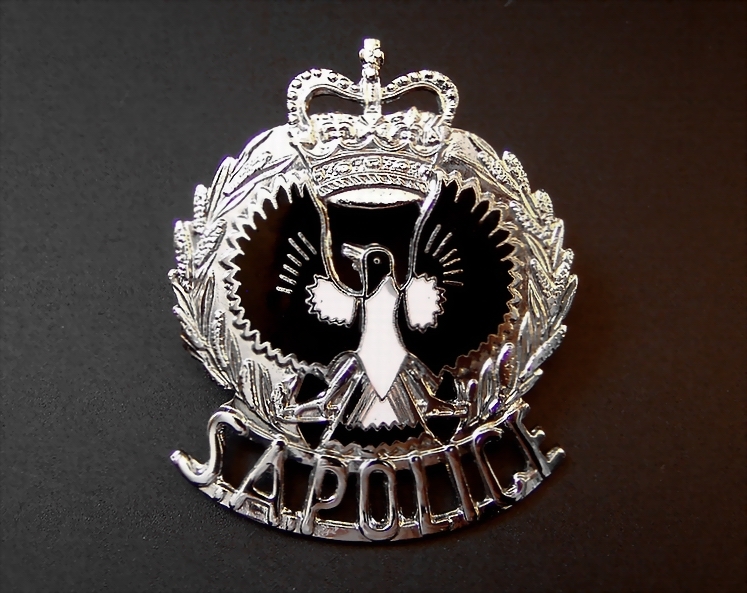 These badges were not issued the SAPD; each one was individually hand made for the officer by a local jeweller. 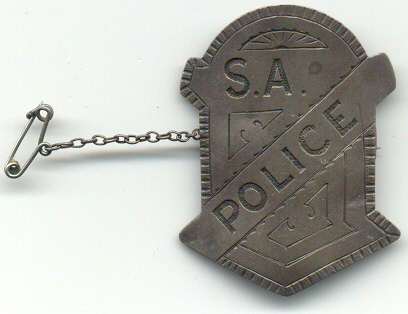 SAPD officer's ID badge. These badges were not issued by the SAPD; each one was individually hand made for the officer by a local jeweller. c 1940's.